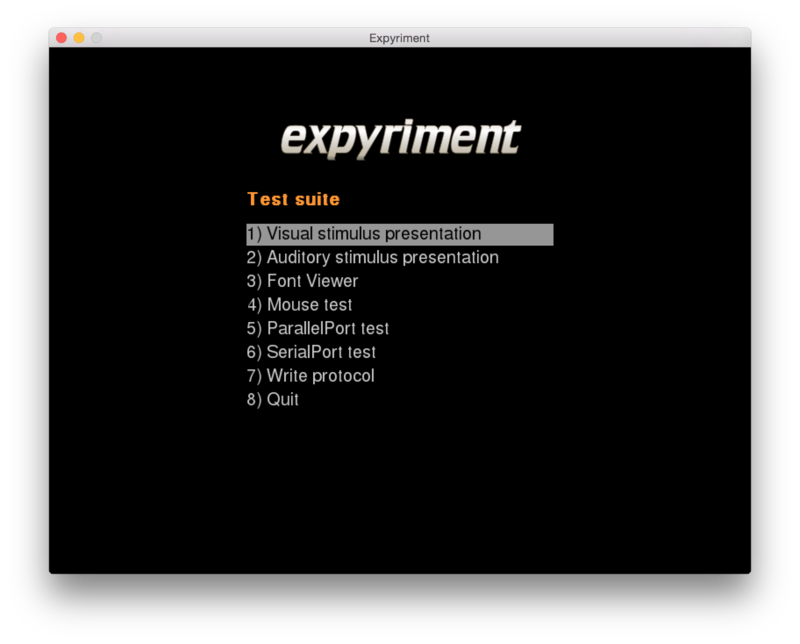 The Expyriment test suite is a guided tool for testing your computer’s abilities and performance. This includes timing accuracy of visual stimulus presentation, audio playback functionality, mouse functionality and serial/parallel port functionality. Eventually, all test results can be saved as a protocol, together with some information about the system. Please note that all changes to the Defaults (settings) prior to starting the test suite apply! Estimated Screen Refresh Rate: The refresh rate of the screen in Hz and the approximated time of a single refresh in milliseconds. The most common refresh rate is arguably 60Hz (marked green), but specialised displays might also have refresh rates between 50 and 120 Hz (marked orange). Reported refresh rates outside of this range (marged red) are most probably erroneous. Saves all test results, as well as information about the system, as a text file.